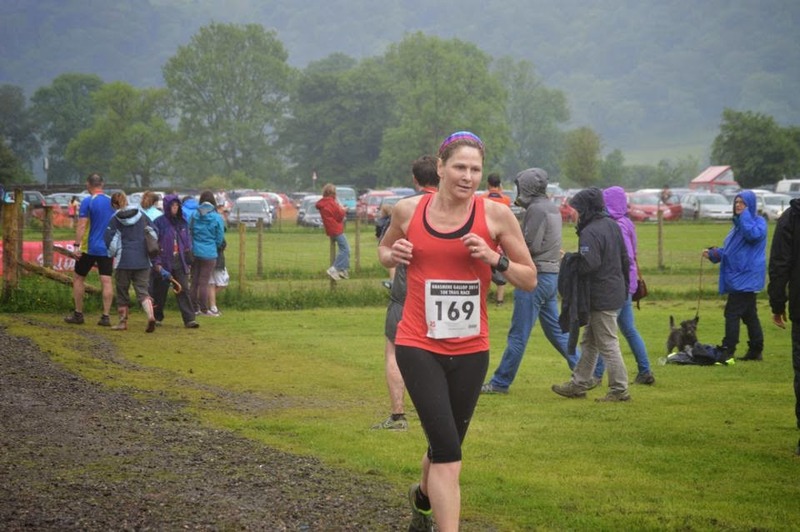 Today, Saturday 7th June 2014 I ran in The Grasmere Gallop 10K trail race. The forecast for today was horrendous with heavy rain and thunderstorms predicted. When I woke up at 7:30am I lay in bed straining my ears for the sound of rain pelting the window! Thankfully, all was blissfully quiet so I got up and dared to peek out! Relief flooded my body when I was greeted by a bright sunnyish morning. I got dressed in my running gear, ate my porridge and had a coffee before setting off on the 17 mile journey from my home town of Kendal to Grasmere. I picked my friend Julia up at 9.15am, who was running the longer 17K route. We had set off early expecting to hit traffic delays on the usually congested Lake District roads! Surprisingly, the traffic was light (everyone must have been avoiding the lakes due to the weather forecast!) and we arrived at about 9.50am exceptionally early for the 11am start! We were directed into a field to park, and it was free! In my experience this is unusual as they normally take advantage when they have a captive audience! We went to collect our race numbers from the race HQ which was situated in a marquee and was exceptionally well organised! On exiting the marquee we bumped into a running friend! A quick chat and photo session occurred before we headed back to wait in the warmth of the car! By now a mass of black clouds were speedily moving across the sky and it didn't look very promising! We had been given instructions to meet at the "muster point" on the playing fields at 10.45am. By 10.40am the heavens had opened and the rain was bouncing off the car! We groaned when we realised the time had come when we were going have to brave the elements. I got out the car with my running rain jacket on, but soon changed my mind when I realised that despite the rain it was fairly warm! With the jacket off we set off towards the designated muster point, where we managed to shelter under a tree! 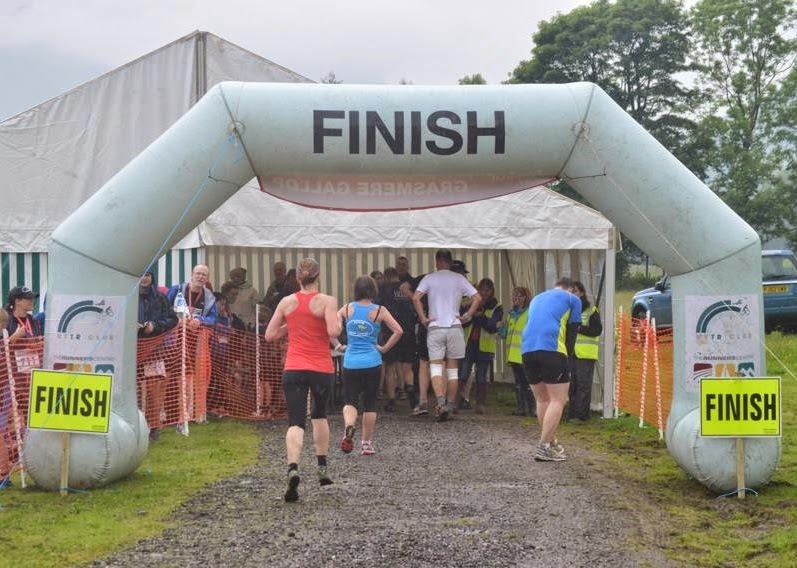 There were 4 races - a 5K, 10K and 17K run plus a Nordic walking 10K! The race director commented that this was the first year that the sun hadn't shone for this race! Typical it should decide to rain for my first time! After a safety talk we were walked through the village to the start line led by a lone piper! Despite the rain there were still spectators clapping us through! and we were finally on our way in the rain which was still teeming down! All 250 participants in the 4 events were set off at the same time, and as this wasn't a chipped event there was a bit of pushing and shoving with people trying to get to the prime front position! 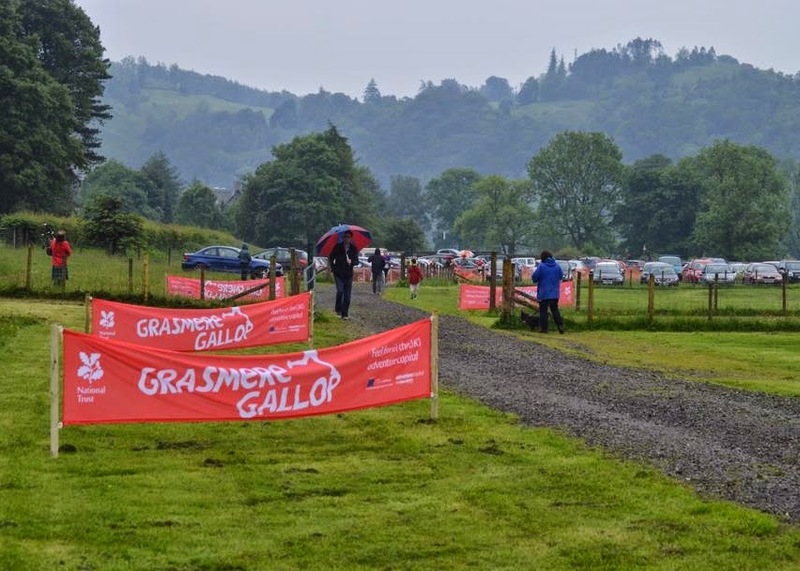 Whatever the distance all the competitors had to take on the testing climb out of Grasmere along Red Bank Road. This road twists and turns and just when I thought I was at the top another corner would reveal another climb! Eventually after this exhausting climb we turned off the road onto a trail through Deer bolt woods. 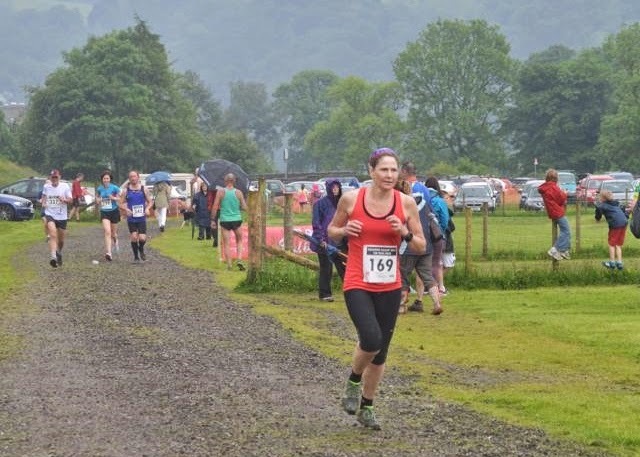 At this point the 5K race took a left turn to return to Grasmere! After following the trail through the woods we had a further climb onto Loughrigg Terrace and over the shoulder of Loughrigg. By now the trails were extremely rough and rocky but had fabulous views over the lake. Its a pity I was too busy concentrating due to the trickiness of the terrain to fully appreciate it! The rain was making the rocks slippy and large puddles were forming on the uneven ground! Thankfully I had opted to wear to my waterproof Inov-8's at the last minute so despite the rain and puddles my feet were still dry and comfortable! The path passed the famous Rydal cave before plunging down a treacherous shale steep hill which had some sharp bends. The loose rubble underfoot made me very nervous and I didn't dare go too fast in case I came a cropper! The 17k and 10k routes split at this point, with the 10K route turning back along the shorelines of Rydal Water and Grasmere heading towards Grasmere village. Thankfully there was a marshall making sure that everybody followed the correct route! I would have hated to have gone the wrong way and end up doing 17K instead! I happily made my way along the shores of Rydal and by now although the path was still rough and very puddley it didn't seem quite as treacherous and my confidence and some speed returned. I even dared to occasionally peek at the views which were magnificent even on such a rainy day! The path went right down to the lakeshore and there was even a calf deep plunge through the lake itself! I thoroughly enjoyed splosh splashing my way through the water - I was already soaking wet so it really didn't matter! Strangely my trainers didn't feel heavy or uncomfortable after this! There was then a short stretch along a good trail before we were greeted by another steep climb! This led back into the woods and back onto Red Bank Road. Thankfully this time I was running down it! Back on the safety of tarmac I felt able to push the pace a bit and dug deep to get to the finish line as quick as I could! The final stretch along the gravel track on the outskirts of the car parking field seemed to be endless! I was delighted when the big finishing arch was in my sight! It was still raining as I crossed the line but I can honestly say I hardly noticed it during the race! I think my mind must have been worrying about other things! As I crossed the line a lady zapped the barcode on my race number which I assume will give me my official time! I stopped my Garmin and was chuffed to see that I had managed to get a sub 1 hour coming in at 58:28! I now need to wait for my official time to be confirmed! On entering the finishers tent I was presented with a medal and had the choice of several different sorts of cake and juice! Bling and CAKE - life doesn't get much better than this! I clapped a number of runners over the finish line before I started to feel cold so made my way back to the car where I stripped off totally and got some dry clothes on! I was wet through to my knickers! I waited in the car for Julia to complete her 17k race before heading off home. I felt rather anxious about actually getting the car out of the now sodden field, but was pleasantly surprised to find that I had no problem at all! The drive home was awful with many of the minor roads now flooded! Thankfully the thunder and lightening forecast didn't materialise! Despite the awful weather I thoroughly enjoyed this race! It was well organised by the National Trust and everything ran like clockwork! There was water stations at around the 2 mile and 4 mile mark, which was served in plastic cups. This was sufficient for today's conditions but I think if it had been a warmer day I might have struggled with hydration! I enjoyed it so much that next year I am planning to run the longer 17K route! I would recommend anyone contemplating this race to DO IT! Hopefully we will be honoured with better weather! The official time has just been announced and I finished in 58:48 which is slightly slower than my Garmin showed! 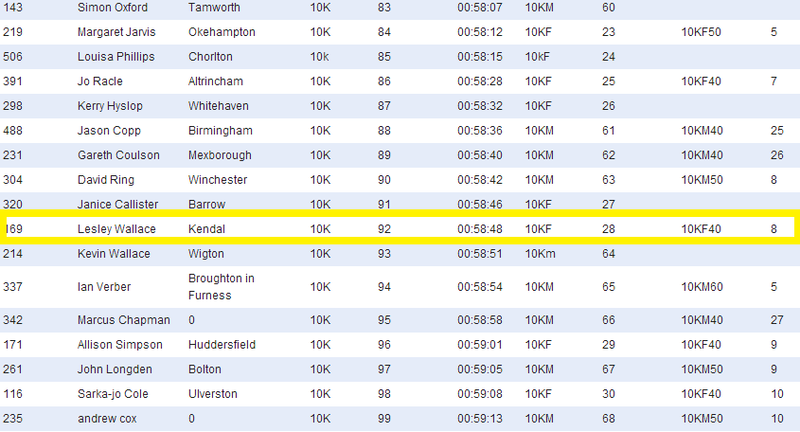 However still very pleased with it as I was 8th in my age category, 28th female and 92nd overall out of 260 finishers! You can view the full results HERE!